Ford Times prints get their name from the publication for which Charley worked, ‘Ford Times’, published by the Ford Motor Company. Charley’s art was featured in this publication for many years in the 1950’s, 1960’s, and 1970’s. It was widely loved and soon Charley was answering a demand for Silk Screen prints of these images he made ( in his garage, as the story goes). These prints typically are signed but not numbered, or may bear an estate seal, showing they came from the Charley & Edie Harper Art Studio. These prints are not numbered, but Charley is purported to have said he never made more than 100 of any image making them truly collectable as limited edition prints. Each of these prints (except the fish prints) are 18-1/2″w x 13″h on sheets 20-1/2w x 15″h. All prints, but “Feeding Station”, are printed in landscape orientation. 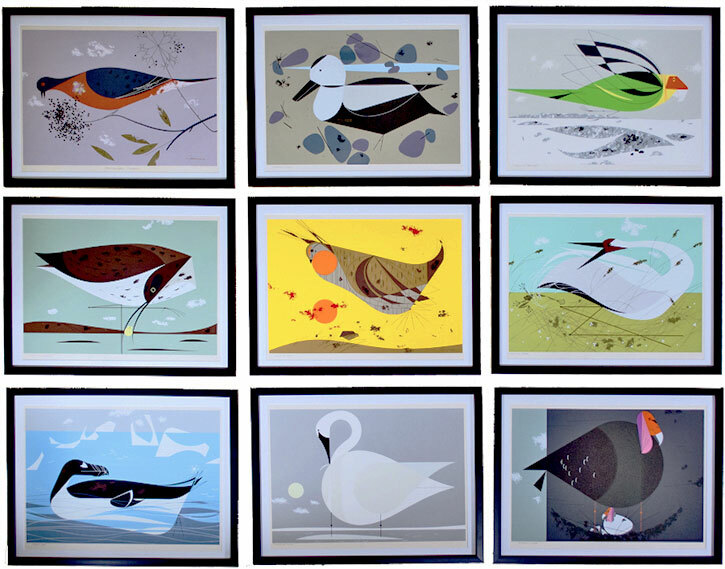 These are all serigraphs, or silk screen prints made by Charley. Due to the age of these prints, minor foxing or other issues may be present. The Ford Times series of nearly 100 prints dates back to the 1950’s, and some of these original prints remain available from the artist’s estate even today. Yet, not all are alike and interesting variations exist. Charley’s work in Ford Times magazine gave rise to the name for these prints, as the images first appeared in that magazine. (See our article “Ford Times Retrospective” for a detailed history of these prints.) Popular demand for the prints resulted in Charley creating hand-pulled silk screen (serigraph) prints and selling them to the public. The earliest of these prints (1952) were available through the magazine, for as little as $4.50 each. Charley continued to publish these prints until 1960. Most of the images were sold out long ago, with very limited stocks of a few images still available today. Charley is reputed to have said that he made no more than 100 of any individual image making these images some of his most limited in number. His later limited edition serigraphs were published in much larger runs of 500 to 2500. 1. Unsigned. These prints do not bear Charley’s signature in any form. There is no known reason why these prints are not signed. 2. Signed in Plate. These prints bear Charley’s hand-signed signature in ink. The signature is located within the image, often in the lower right corner. These prints are among the earliest of the Ford Times prints. 3. Signed in Margin. These prints bear a pencil signature in the print margin, just below the image in the lower right corner. Typically, these prints were produced, or at least signed, later than the ink-signed prints. 4. Estate Stamped. After Charley’s passing, in 2007, the Harper estate began affixing an embossed facsimile signature in the lower right margin of prints distributed by them. This is essentially a guarantee that the print is authentic and issued by the Harper Estate after Charley’s death. These prints were all created by Charley much earlier. Despite these five variations, it is quite possible that more exist. For example, we have not seen a signed-in-plate print also containing a personalization, or a pencil signature, or an embossed signature, yet all potentially exist. The existence of differing print states does not affect print value; the retail price for Ford Times prints does not distinguish between print states. However, in reality, collectors are generally willing to pay more for a signed print.